Welcome to my new blog series about active things to do in Fort Worth. I love the idea that exercise doesn't have to feel like exercise. Remember when you were a kid and you ran around the neighborhood, pedaling everywhere you went, climbing trees, and racing your best friend to the top of the stairs? You didn't realize it then, but you were exercising. Exercise doesn't have to be boring or so formal. 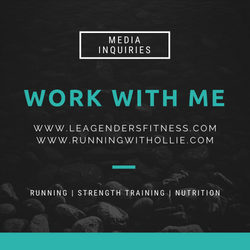 I love the idea of doing the kind of fun stuff that burns calories, that gets you moving, but has nothing to do with a formal training plan. 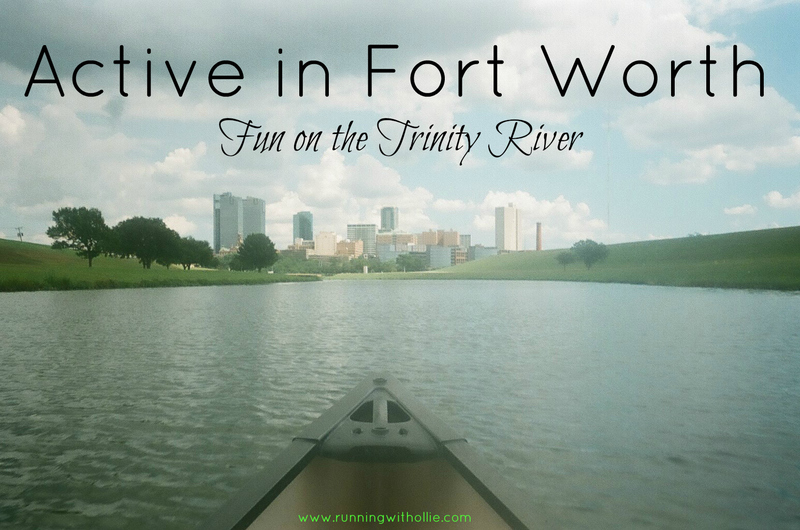 I am going to try some new fun activities around my town as way to supplement my formal training and blog about them as part of a new series: Active in Fort Worth. 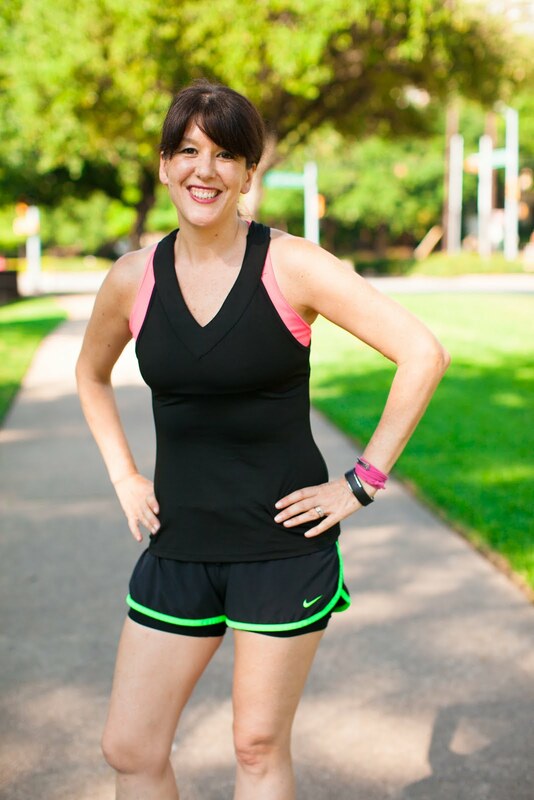 If you are new to exercising, these are great ways to just get out there and get moving. 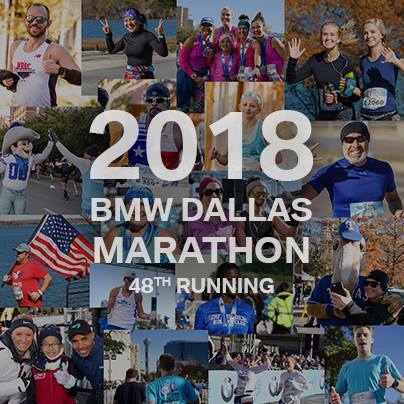 And if you are reading from somewhere else on this great planet besides Fort Worth, TX, I am sure with a quick internet search you can find similar activities in your own hometown. 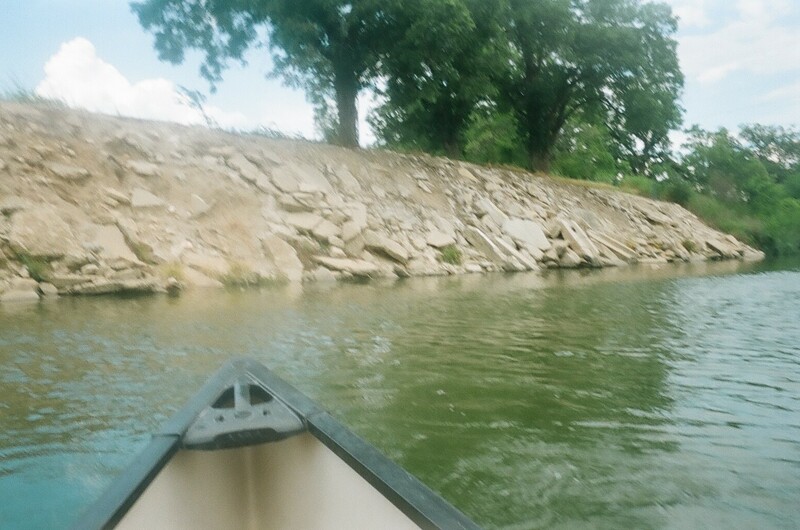 The first edition of the series is about our adventures on the Trinity river. 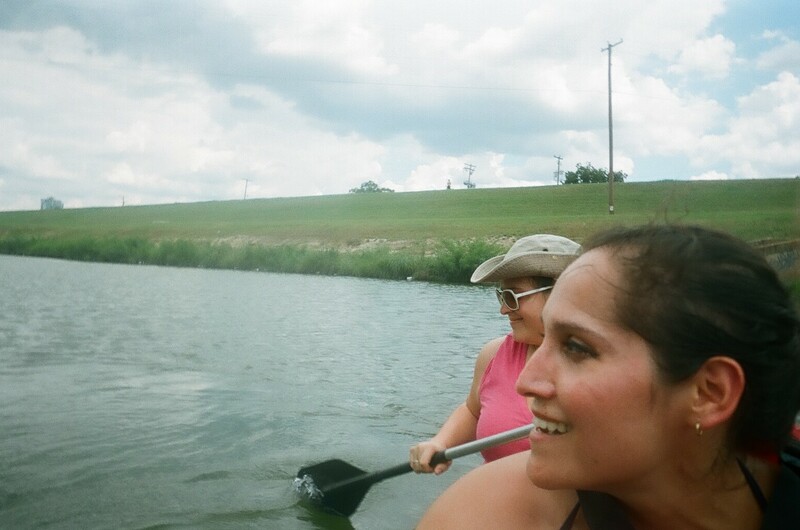 We went canoeing this weekend! 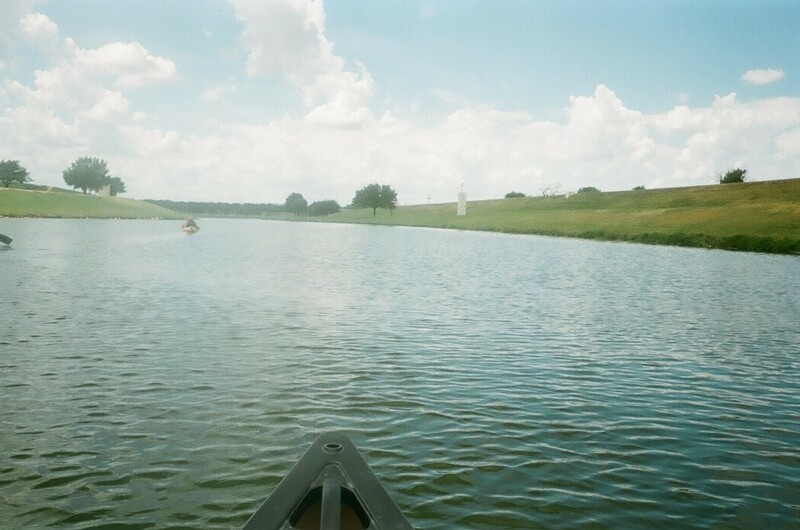 I haven't been on a canoe since my teenage years at my Grandmother's camp in Tionesta, Pennsylvania. I recruited a couple friends for a day trip excursion and we set out for Backwoods Kayak and Canoe Rentals in Fort Worth, but it wasn't exactly located in the backwoods since they are literally located in the booming metropolis of downtown Fort Worth. A quick drive downtown and we were loading in. 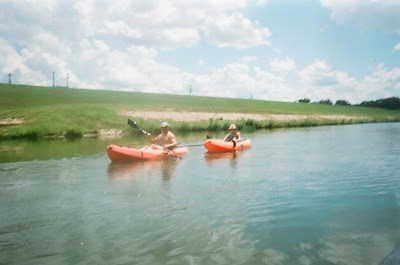 We set out to rent kayaks but there were three of us and they didn't have three kayaks available. You can not make reservations and it is first come first serve. 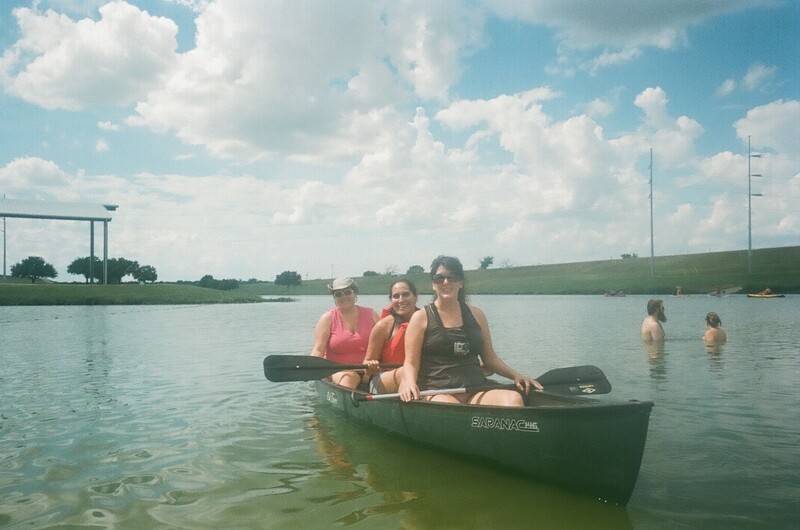 We agreed to a canoe which would seat all three of us in the same boat. "You're going to miss the boat." It was $20 for an hour to rent the canoe and they provided life jackets and quick instruction. We rowed out about thirty minutes, turned around and rowed back. It was surprisingly cool for a July afternoon in Texas. We were lucky to have overcast skies and a light breeze. It felt much cooler on the water than it did on the land. This place was pretty happening on a Sunday afternoon, but not overcrowded at all. 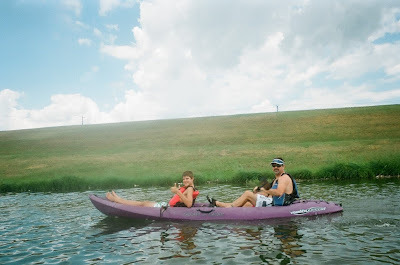 We saw a lot of families out there being active together! It was great. A staff member helped us get into the boat, showed us some quick techniques and we were off! I had to turn around really slowly to snap this picture of Cathy and Hallie, as to not rock the boat. New friends on the river in a two person kayak. "Smile, you are going to be on my blog!" 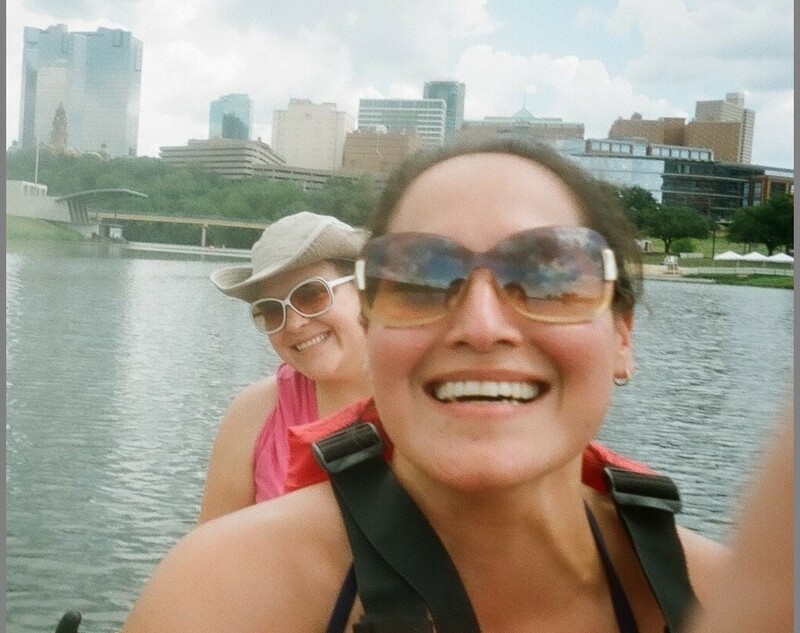 They also had paddle boats and I think next time I want to try to peddle my way down the Trinity river, because after an hour my arms and shoulders were getting tired from all the rowing. Let's give my legs a chance to get tired next time. 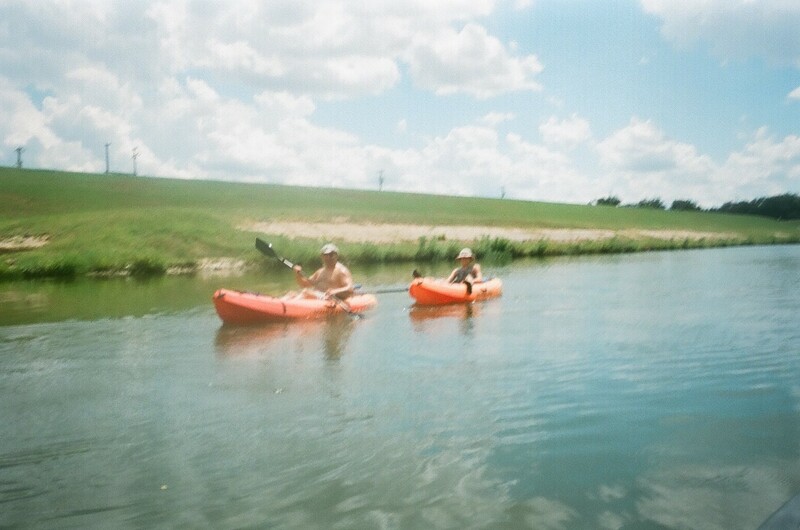 We past a couple of people in the single person kayaks. Hallie turned us around at the thirty minute mark. I have almost zero navigation skills. She kept us on point the whole trip making sure we didn't hit any other boats or paddle boarders. Here we are at the turn around. I surely would have ran into the rocks had I been in charge of steering. I can barely steer my car. 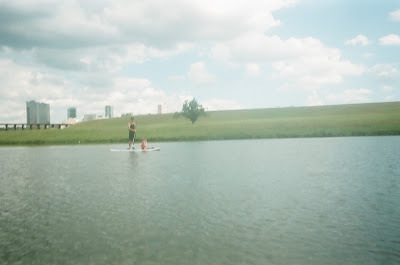 I think the stand up paddle boards looked fun too (although I have a fear of falling in the Trinity river and growing an extra eye). This guy was out there on the stand up paddle board with his young daughter! How sweet. We turned around and pointed back towards downtown Fort Worth. Back to shore, posing for the picture. I think that for $20 for three people, this was a fun, inexpensive, active excursion. 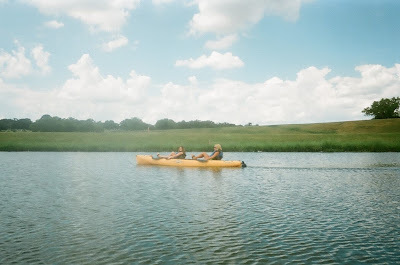 I thought one hour was the perfect amount of time, but of course, you could always pay more if you want to be out on the river for a longer period of time. 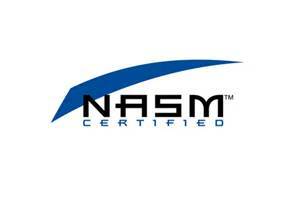 The staff was fun, helpful, and knowledgeable, and we had a great experience. I can't wait to get back out there! Did you do anything active this weekend? Stay tuned for more Fort Worth adventures, and who knows, I might even venture off to that far away land they call Dallas. This weekend, I did a very foggy bridge run and then on Saturday, sat outside for three hours in the most sweltering heat I can remember for Jaguars training camp. I wasn't actually moving, but I was using every ounce of energy just to stay upright. It was that hot. Just $20? That's a very reasonable price for that trip. Love this new series idea! The canoe trip looks like a lot of fun! I would be a little paranoid of falling into the Trinity River though! Definitely wouldn't want to do that! Yes, I had the same fear! 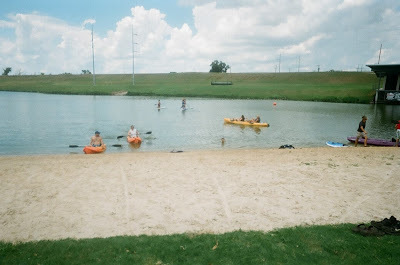 They had stand up paddle boards to rent, but I said I was afraid to fall in and grow a third eye! :) Maybe I'll save SUP for an area lake. :) Thanks for checking it out! What a great series! It's funny, back a few generations, people didn't have to plan to exercise, they just did things! I love this idea for a series of posts and I look forward to reading more and getting more ideas.